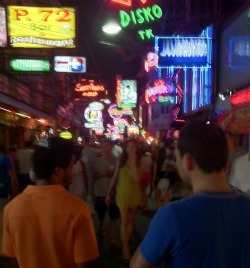 Check out the infamous "Walking Street Pattaya" in Thailand. This street is the most famous nightlife tourist attraction in Pattaya. What is it about this street that captivates us? After all - many people convert to becoming expats here because of it. What does it have that's so appealing? These are just a few of the 'naughty' things in this part of town. Sure you can find these kinds of places elsewhere in the world but...they don't have what I like to call: The Pattaya Flair. ...you name it, it's all here in 1 street and its sois (alleys). There's everything here that can please you. These venues are also very close by one another. This makes it even more appealing. Want to see something 'naughty'? Just walk for 2 minutes and you'll find a place that suits you. Rather chill out to some good Thai food? Walk another 2 minutes and you'll find something good to eat too! of any place in the world. What Are You Hoping To Find On This Street? Like many people there is something in particular we are wanting to experience on this street. Rest easy knowing that you'll find it...no matter how much on the 'wild side' it is. The best part is that whatever happens on Walkin street Pattaya stays there.